Green tea has long been praised for its health benefits. Drinking green tea has been shown to encourage weight loss by promoting fat oxidation and an increased expenditure of energy. While drinking green tea has several benefits, be aware of the potential side effects associated with excessive consumption of green tea. Green tea contains on average of 30 to 60 mg of caffeine per 6 to 8 oz. cup. This is less than the average 100 mg caffeine contained in a cup of coffee. Green tea is generally consumed in greater amounts when used for weight loss. Drinking more than five cups of tea per day can raise your caffeine intake to unsafe levels, increasing your risk for insomnia, restlessness, tremors, and upset stomach. Tannins are compounds contained in green tea that bind with non-heme iron in the body. Nonheme iron is the type of iron that is contained in plants and iron-fortified foods. It is not as easily absorbed in the body as heme iron, however most iron in the diet is typically nonheme iron. Tea expert Lindsey "Vee" Goodwin of Vee Tea notes that the tannins in green tea can form insoluble bonds with iron in the body, rendering the iron indigestible. According to Goodwin, "The typical decrease in iron absorption from a meal with a cup of tea in clinical studies is approximately 30-60 percent." This interferes with iron absorption, which can lead to iron deficiency anemia. Iron deficiency anemia can cause feelings of weakness, shortness of breath, irritability, headaches and irregular heartbeat. Epigallocatechin gallate, known as EGCG, is a compound found in green tea. A American Association of Cancer Research study on the anti-folate activity of tea showed that EGCG can interfere with folate use in cells. Folate is needed to make DNA and prevent negative changes to DNA from cancers. Folate also helps to make red blood cells, protect against heart disease and prevent anemia. It is important to be aware of green tea intake to prevent folate deficiency. According to the website World's Healthiest Foods, one cup of green tea supplies 20 to 35 mg of EGCG. Contact your doctor to determine a safe intake amount for you and your specific dietary needs. Green tea is a natural diuretic, which means that it causes your body to lose water. Drinking excessive amounts of green tea (more than five cups per day) can cause excessive urination leading to dehydration and electrolyte imbalances. Dehydration can also cause headaches, lethargy, altered heart rate and shock. According to the University of Maryland Medical Center, green tea can interfere with the absorption and effects of certain medications. This can lessen or intensify the effects of medications, which could put your health at risk. Some medications that might be affected include MAOI inhibitors, lithium, adenosine and blood thinners. 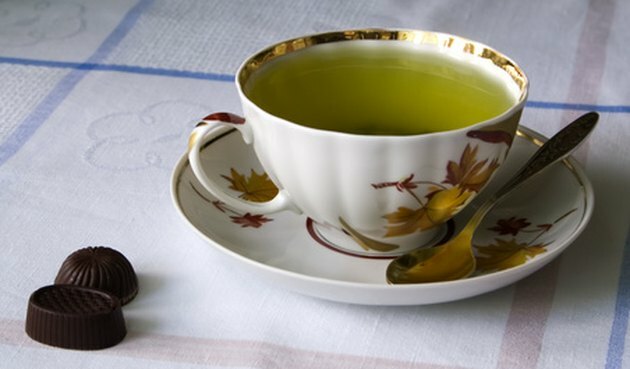 Discuss your green tea intake with your doctor to ensure you are not interfering with the medications you are taking. University of Maryland Medical Center: Possible Interactions with Green Tea. MayoClinic: Caffeine, How Much is Too Much? What Are the Dangers of Theanine? Why Do Hospitals Say Not to Drink Green Tea With Prescription Medication?